Well as predicted, nothing much happened yesterday in terms of Arsenal news. And there isn't too much going on this morning either. However I've brought you all the major and minor lines from the Sunday papers in one neat and tidy blog as I tend to do. We'll start with news that Cesc Fabregas and Robin Van Persie will be back in north London on Thursday, when the annual picture of the first team squad is being taken at the Grove. Steve Stammers, who has good Arsenal connections, writes in the Sunday Mirror that Arsene Wenger will use the opportunity to talk with Cesc about the forthcoming season and his commitment to the club. If a massive bid doesn't materialise from Barcelona, Cesc can be sure that he'll be an Arsenal player next season. "It would need to be a massive – and I mean massive – bid for the club to consider it." Now we're talking in the regions of Cristiano Ronaldo to Real Madrid proportions. The article suggest that Fabregas should commit his near future to us and then we'll let him go next summer. I believe the only time we should seriously consider allowing our captain to go is when (A) we are offered a good price for him, (B) we are in a position to replace him and (C) he'll get a starting place week in week out at Barcelona. Fabregas and Van Persie won't start training until August 3, so if you're heading to the Emirates Cup you might see them as cheerleaders, but not in Arsenal kit on the pitch. The general assumtion that Fabregas is staying in north London is further given weight by Andres Iniesta who has been speaking with the News of the World. 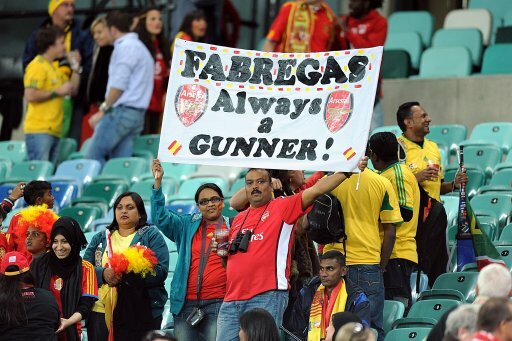 "Cesc wants to be with us, but he told me how close the Arsenal fans are to his heart. "He is a special player and I hope he wins the title at Arsenal this season. "For them to win Cesc will have to stay fit and injury-free but he deserves to finish with a title. "For all the work and effort he has put in at Arsenal it would be a shame if it was all fruitless. "I have seen time after time Lionel Messi win games for Barcelona when the rest of the team have not been on form and Cesc can do that for Arsenal this season." "Arsenal are not as strong as Chelsea. But they try and play football the way it was intended to be played and that should be rewarded. "Cesc is such a special player that he could carry a team to the title on his own and I hope he does it this coming season. "It would be brilliant if Arsenal's hero could lift the title as captain during his last season. "I think that it would be fantastic for everybody." There is a little too much assumption on Iniesta's part that this is Fabregas' last season with Arsenal. Anyway, it's good that this Barcelona player is finally getting round to the fact that Arsenal never had any intention of selling Cesc this summer. Johan Djourou has been talking to the Arsenal.com about the opportunity this season presents him with. With the void left by William Gallas and Mikael Silvestre moving on to play their club football somewhere else this season, it obviously leave our Swiss defender with a big chance to grab a starting place. "Now it is time to step up and start. I will always say that but now I am mature enough. "We will have to see with the injury because when you have it for so long it is difficult to come straight back into things. "But I played 90 minutes against Strum Graz and it went well. I have to get other games under my belt and hopefully I will be ready. "I thought that we were looking quite solid. But it is true that 41 goals is too much when you are playing for the top places. "I think sometimes we are missing a bit of aggression. It is not that we are not good enough, because the team is good enough. "We have top players at the back, top players all over the pitch. It is just that we have to be stronger as a unit." Which is true. Look at how Barcelona play and win the ball back. We need to do that. Not just at the start of a season by for the whole nine months of the campaign. His new team mate Laurent Koscielny has been talking to the official site as well. "I like physical challenges and I'm a player that can anticipate situations. I feel that I read the game well and one of my strengths is challenging for the ball in the air. "However, being at Arsenal, I know that I will have to work harder on all of those points to reach a higher level." It's going to be an interesting season for Koscielny. He's got a big step up to make. Lets hope for Arsenal's sake and his own reputation he can do it. On to a round up of the transfer rumours making the papers this morning. The Mail on Sunday link us with Phil Jagielka and say we're going to make an offer of £15m. Whilst the People say Everton are refusing to meet us to discuss a move for their defender. Jagielka has a five year contract with the Merseysiders and at 27-years-old you've got to balance that with any resale value. The Sunday Times (paywall) link us with a move for Mesut Ozil for a fee of around £10m. Ozil, 21, has a year left on his contract with Werder Bremen. I say if we want him get him for free next summer. Manchester United, Barcelona and Real Madrid are also sniffing around. There are a few lines on the goalkeeping front this morning. We're linked with a further three on top of the move we've already made for Mark Schwarzer. The Mail on Sunday says we've turned down an offer to sign David James who is out of contact with Portsmouth. They also report that Manuel Almunia will leave the club once a buyer is found. The Daily Star Sunday goes on a different tact. They suggest that Russia goalkeeper Igor Akinfeev, who currently plays with CSKA Moscow. At 24, maybe Akinfeev is too young and is along much the same lines we've already got. Although he does have both international and Champions League experience. He has a contact with the Russian club until 2013. Whilst the News of the World say we're looking at Ajax goalkeeper Maarten Stekelenburg. They say the 27-year-old would be available for £4million. And finally on the goalkeeping front, Steve Stammers in his Sunday Mirror piece has a line about Mark Schwarzer. He says the club will up its original bid by £500,000 to £2.5million. However no deal with Fulham is likely to take place until they have a new manager. And that's it. More on Twitter if anything happens throughout the day. Enjoy your Sunday.